[dropcap]J[/dropcap]osé Mourinho’s tone was typically acerbic in dismissing his team’s “Playstation football” on the Champions League matchday one. Sure, Manchester United comfortably beat FC Basel, the limited Swiss side that is unlikely to make the knockout stages, but Mourinho could focus only on his team’s perceived lack of professionalism. There will be no repeat of the late showboating that marked United’s victory at Old Trafford as Mourinho’s team takes on CSKA in Moscow this week. Indeed, the weekend’s ugly if ultimately successful trip to Southampton may portend much for the game in Moscow. On the South Coast Mourinho’s team ditched the previously free-flowing football in favour of a counter-attacking style that morphed into all-out defence in the second half. Pretty it was not, but effective? Just about. Then, this is a period of seven games in a month, including six on the road. Mourinho, being Mourinho, was always likely to rein in his players just a touch, to “let the horses run freely” just a little less often. The message has landed, with Henrikh Mkhitaryan admitting that Mourinho’s post-Basel comments had struck a nerve. “Of course everyone knows José Mourinho is very demanding and what he said is right and he didn’t exactly say names but everyone thinks, ‘I’ve done something bad, done some mistakes,'” said Mkhitaryan on Tuesday. Not least because this is a CSKA side that the Portuguese coach seemingly rates highly, albeit a team that now lies seven points behind the Russian Premier League leaders after 11 games. Viktor Goncharenko’s side has lost three times in a mixed start to the new season, but finished last season’s campaign second. “I play against CSKA with Real Madrid, with Inter, with Chelsea and now with Manchester United, so it’s something normal in my Champions League career,” Mourinho told journalists on Tuesday. United will face CSKA without a clutch of key players, including Paul Pogba, Marouane Fellaini and Michael Carrick, although there should be plenty left in a squad that is better placed to manage injuries than last season. The opponent, location and injuries suggest a pragmatic approach on Wednesday, with United seeking to exploit the pace of Mkhitaryan, Marcus Rashford and Anthony Martial on the break. No Playstation football, but plenty of quality all the same. And the match promises to create a lively atmosphere at CSKA’s compact 30,000 capacity VEB Arena in the Khodynka Field district of Moscow. The stadium was opened in late 2016, just a few miles across town from the Luzhniki, where Sir Alex Ferguson’s team won the Champions League in 2008. CSKA is no longer the force of old. Having won three out of four Russian Premier League titles between 2013 and 2016, the capital side came second last season, some seven points behind Spartak. Originally formed as the Russian Army club (CSKA – Central Sports Club of Army), CSKA was privatised after the fall of the Soviet Union, albeit with the Ministry of Defense retaining a shareholding in the club. CSKA club has won 13 Soviet or Russian league titles and, in 2005, secured the UEFA Cup, its only European honour. Having recently moved to a new stadium there is hope of progressing in both domestic and European competition. United beat CSKA during the 2015/16 campaign, albeit during a season in which Louis van Gaal’s side exited at the group stage. The Dutchman’s team drew 1-1 in Moscow at the compact Arena Khimki. Following Leonid Slutsky’s resignation last winter, Goncharenko was appointed CSKA manager on a two-year contract. Goncharenko was born in Belarus and appeared for BATE, Strelichevo Khoiniki and RUOR Minsk during a modest playing career. He was Belarusian Premier League champion in 1999 and 2002, before being forced to retire through injury at the age of just 25. As a coach, Goncharenko has spent time with BATE, Kuban Krasnodar, Ural Sverdlovsk Oblast and FC Ufa. With BATE, he won five Belarusian Premier League championships in a row between 2008 and 2012. “We have a lot of experience and class,” said Goncharenko. “Our task is to find some weak points in the opposition and put pressure there. We know there will be a great atmosphere at our wonderful stadium and we will be well supported. Our team is going to be so hugely motivated and focused on the match. Among the “class” available will be midfielder Alan Dzagoev, who at one time appeared destined for bigger and better things. The midfielder made his début for CSKA in 2008 as a teenager and now has more than 50 caps for the Russian national team. Dzagoev has also won three domestic titles and four Russian cups with CSKA. He was the top scorer at Euro 2012. Yet, the big money move away from Russian football near materialised as it seemed near certain in the earlier part of the decade. Now 27, Dzagoev retains his status as CSKA’s creative fulcrum, but may not have achieved the success that his prodigious talent as a teenager demanded. Mourinho will have limited midfield options ahead of the matchday two fixture in Moscow, with Pogba, Fellaini and Carrick all out. The United manager is likely to field Ander Herrera and Nemanja Matić in central midfield, while Mkhitaryan continues at number 10. Fellaini could also miss this weekend’s fixture at home to Crystal Palace after being injured in a challenge by Southampton’s Shane Long at Southampton. “It was only when I saw it on TV that I realised that Fellaini was very lucky,” added Mourinho. 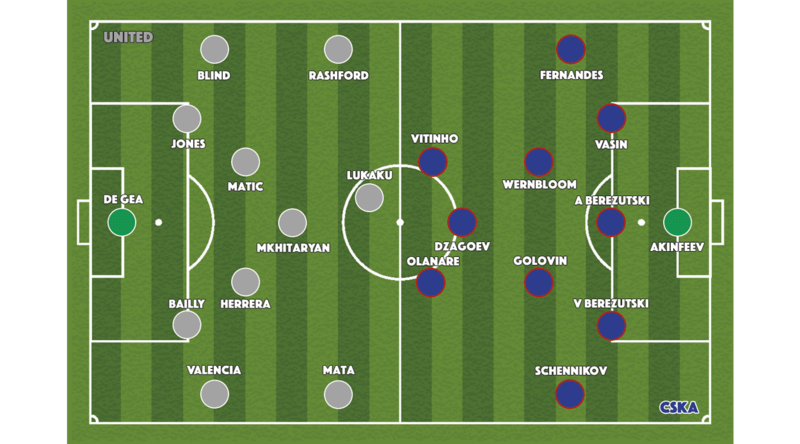 In defence, Mourinho will choose between Daley Blind and Ashley Young at left-back, while Rashford and Martial may be competing for one spot – as they have done all season. Just a minor observation.Before every match you guys predict a very close scoreline. I would love a see a bit wild prediction. Apart than that, thank you for writing such beautiful articles. Love them.